Back from the launching and have had time to reflect…. It was a media launch and I wished the M.C. had asked for a show of hands how many members of the media were present. 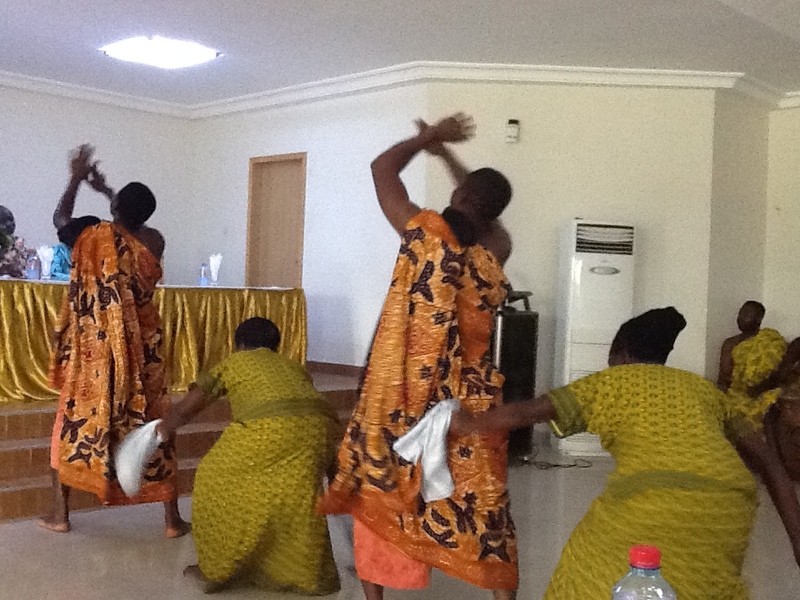 It seemed like there were a lot of my colleagues from the Ashanti hospitality industry. From left to right at the head table were. Ahmed Naaman, head of the Dodi Group and a colleague of mine, Dr James Adjei, Chairman of the Ghana Hotels Association, Mme Lois Ohene Ayisi, a Director at the Kumasi Metropolitan Assembly representing the Chief Executive of Kumasi i.e. the Mayor, Mr Sampson Donkor, Deputy Executive Director of the Ghana Tourism Authority and at the far end Mrs Mavis Gyasi-Afriyie, Ag. Regional Manager of the G.T.A. here in Ashanti. Speeches were made. The focus was on sensitization, not on sponsorship. Shame on me for thinking sponsorship would come from those in the running for prizes. But it only makes sense, the more you want, the more you want to support…anyways.. It was after the speeches and the wonderful performances by the Amamreso Cultural Troup from the Centre of National Culture, Kumasi that I got down to work. 1. I introduced myself to Mr. Donkor as the initiator of the SCRAP SHORT TERM TOURIST VISAS TO GHANA page which he has joined. I then switched tracks and congratulated him on being so outspoken after the presidential debates when not one candidate talked about tourism’s role in national development. Given the G.T.A. 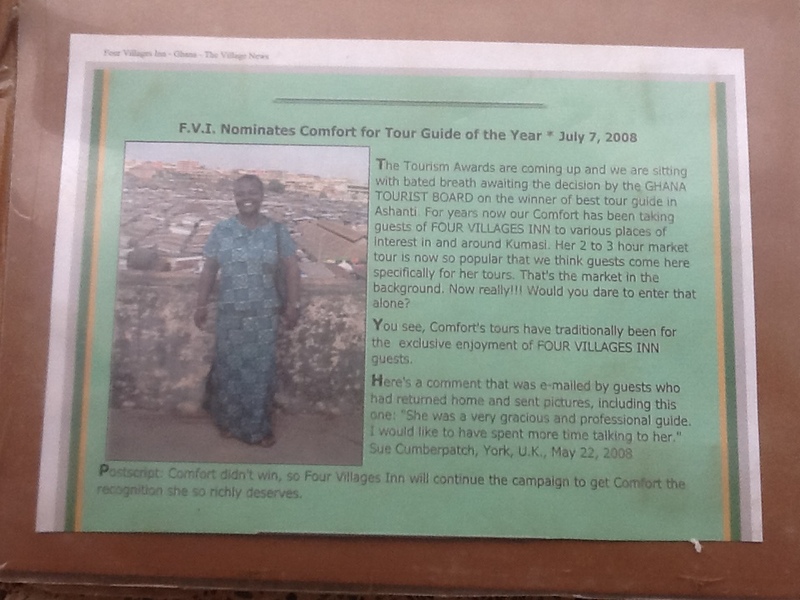 Special Events Officer Mr Ben Anane-Nsiah’s absence from the occasion, I passed along a photocopy of Comfort’s review book along with Four Villages Inn’s covering letter nominating her for the Walking Tour Guide/Private Sector Guide of the Year Award. He assured me that he would pass it along to Ben. 2. I sat with the Kumasi Metropolitan Assembly representative, and we talked Kumasi. I told her I was delighted with the news about plans for a second economic capital…and I said that if this happened and Kumasi was chosen then Kumasi must get its international airport. She said that the airport project was progressing at Asawasi. 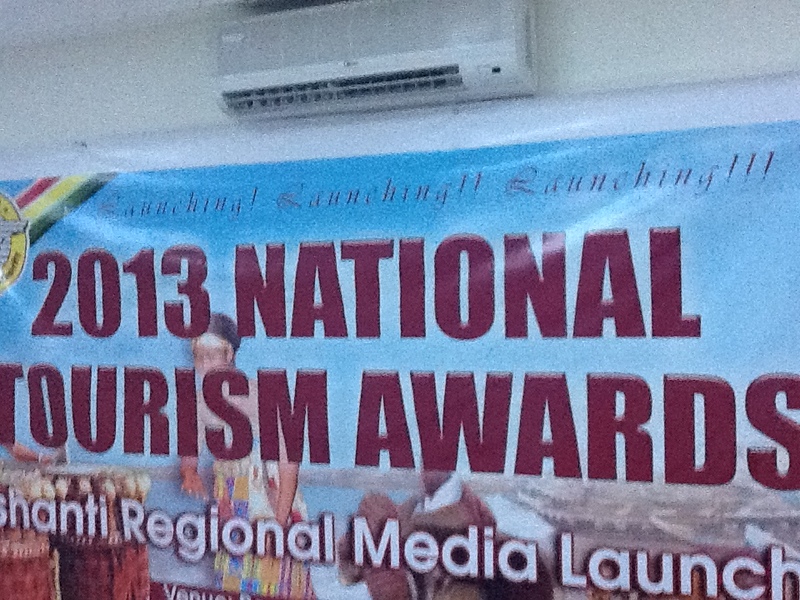 I’m not sure though that even with a second runway the present Kumasi Airport would meet international standards…. And she dutifully added that our new mayor was working very hard for the city. I did mention the scrap campaign briefly saying how Ghana’s tourism is being severely undermined by prohibitive visa regulations like tourists having to acquire letters of invitation! 3. Ahmed Naaman of the Dodi Group approached me and said he was following my efforts. I think he is referring to the Scrap campaign. 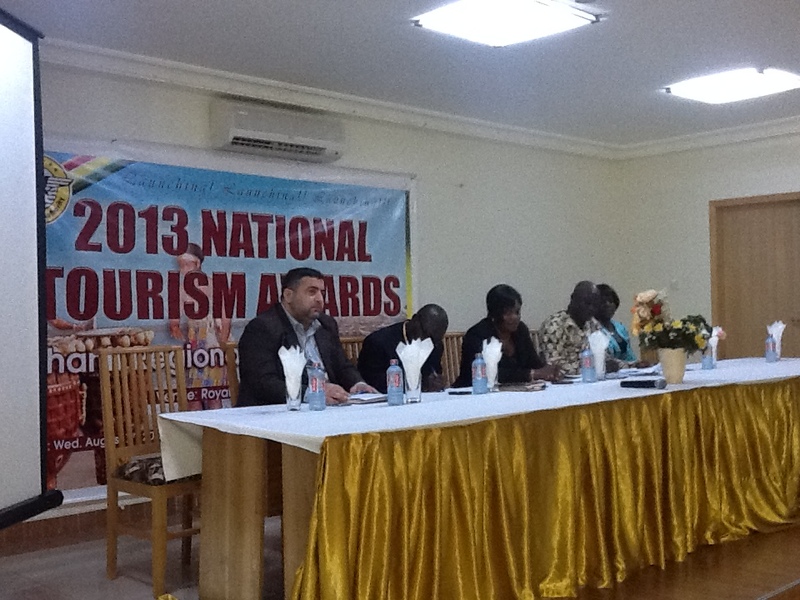 Ahmed is a member of Tougha (Tour Operators Union of Ghana). 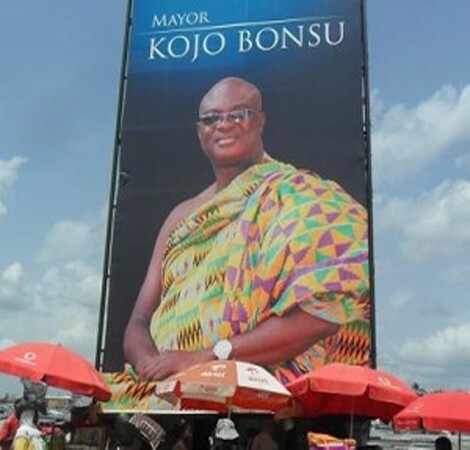 Just recently, a former president of TOUGHA has now taken the reigns of GHATOF which stands for Ghana Tourism Federation (GHATOF). On their GHATOF website they proclaim themselves as “the highest organization established to champion the cause of the private sector in Ghana’s tourism industry.”HA! Well, I said to Ahmed that the campaign was going nowhere because those in power in the private sector as well as those in power in the public sector were silent. I said I soon might start to shame those that have been approached and had chosen not to voice an opinion either pro or con. I mentioned the newly sworn in President of GHATOF Mr. David Nana Anim who I have messaged/emailed twice-no reply! Incidentally, it is encouraging that GHATOF and the Ministry of Tourism have announced their mutual co-operation. Maybe they have both agreed to disregard the Scrap campaign because they both have! Again, HA! So, I just joined the GHATOF Facebook page and the all 8 likes! A little reflection can lead to a lot of thoughts…. Hmmmm….Coconut Grove Hotels a sponsor of the Ghana National Tourism Awards….corporate social responsibility….Paa Kwesi Nduom, owner of the Coconut group and former presidential candidate is one smart guy here!